In the main event of November’s UFC 193, Holly Holm shocked the world by putting Ronda Rousey to sleep with a second-round head kick, stealing the women’s bantamweight crown in the process. A little less than four months later, Holm lost that title in a similarly emphatic fashion, being put to sleep by a Miesha Tate rear-naked choke in the co-main event of UFC 196. The curtains closed on her reign almost as abruptly as they’d opened. To suggest Holm’s UFC 196 title loss diminishes her status as one of the division’s very best fighters, however, would be wildly inaccurate. While she ultimately fell to Tate, the fight was competitive until the moment it ended, and her lopsided destruction of Rousey, who had made all of her previous opponents look amateur, is still a monumental accomplishment. Yes, despite the loss of her crown, Holm remains one of the very best female bantamweights on earth. All the same, the former champ will now be forced to reconcile her title loss (which also happens to mark her first defeat as a pro mixed martial artist) and get back on the horse. This, of course, begs the question: who’s next? Well, from Holm’s perspective, the most favorable next step would undoubtedly be a do-over with Tate. Theirs was, after all, a close fight while it lasted, and given that neither woman appeared to take any serious damage in the Octagon, this rematch could conceivably happen quite soon. Then again, the world seems to be tiring of immediate rematches, and so Holm will probably be forced to turn her attention to a non-title fight. In this event, the most compelling choice would clearly be a rematch with the returning Rousey. Despite Holm’s title loss, this rematch remains an incredibly lucrative option for the UFC, and considering Rousey’s long layoff, might actually make more sense than and immediate Rousey title shot. Yet at the UFC 196 post-fight press conference, UFC president Dana White all but guaranteed that Tate’s first defense would be against Rousey which, in turn, means that Holm’s next date will not be with either woman. Luckily, the women’s bantamweight division is stronger than ever. That means that Holm has some seriously intriguing options beyond Tate and Rousey. She might, for example, be matched up with Brazil’s Amanda Nunes. In the first bout of UFC 196’s main card, Nunes extended her win-streak to three with a strong win over former kickboxer Valentina Shevchenko. And while under normal circumstances, this win probably would have earned Nunes’ a shot at Tate, she, like so many other bantamweights, is at the mercy of Rousey’s return. Yes, while Nunes has certainly made a strong case for a shot, she’ll probably be forced to take another fight while we wait for Rousey’s comeback to unfold. In that regard, there are few better choices for the Brazilian than the former champ Holm. Similarly, there are few better choices for Holm than a top-contender like Nunes. Why not let them duke it out while Tate and Rousey settle their score? Of course, Holm’s options don’t end with Nunes. She might also, for example, be matched up with Cat Zingano. Zingano has remained on the shelf since a 14-second loss to Rousey over a year ago. And while she was quick to campaign for a title shot in the wake of Holm’s loss—evidently gambling on the strength of her 2013 defeat of Tate—it’s unlikely that her wish will be granted. For all of Zingano’s strengths, her blitzkrieg loss to Rousey and long layoff keep her a fair distance from a shot. 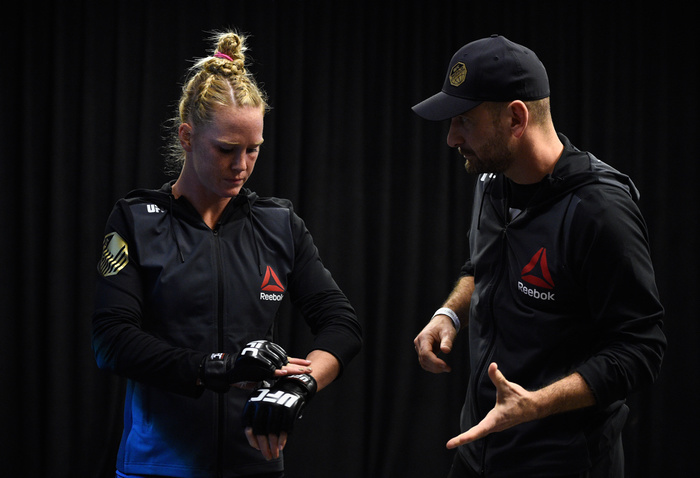 A bout with Holm, however, would give her the opportunity to change that, while it would also present Holm with the chance to reassert herself as the division’s top contender. Finally, a collision of Holm’s precise counter striking with Zingano’s wild aggression could only result in fireworks. Indeed, the fight would not only be a sensible one from a rankings standpoint, but it would also be a sure-thing in terms of entertainment. And then, of course, there is Holm’s money fight: a clash with Invicta featherweight champion and long-time Ronda Rousey rival Cris “Cyborg” Justino. For the duration of Rousey’s reign, Cyborg campaigned relentlessly for a title shot. Unfortunately, her inability to get down to 135 lbs rendered this shot an impossibility. And while Rousey’s title reign was somewhat marred by a reluctance to move up in weight for a clash with Cyborg, Holm’s was not. From the moment she wrested the title from Rousey’s waist, Holm made it clear that, if it was the fight the world wanted, she would happily jump up to featherweight to fight Cyborg. And while Holm’s loss to Tate drains a bit of the juice from this prospective showdown, it remains one of the biggest fights women’s mixed martial arts can currently produce. The case for Holm vs. Cyborg gets even stronger in light of Cyborg’s recent call for a scrap at UFC 198 in Brazil this May. Whether its at bantamweight or not, her being given a bout with the UFC is long overdue, and given that Holm didn’t take any substantial damage against Tate, she could well be ready in time for UFC 198. At this stage, there is little reason not to throw these decorated strikers onto the canvas together, and just like a pairing of Holm and Zingano, this one would almost certainly be a thriller. The significance of Holm’s loss to Tate can’t be understated. It was her first as a pro, and it marked the blink-of-an-eye end of a promising looking title reign. That said, the former champion has plenty of exciting options ahead, and despite being one of the division’s older competitors at 34, seems to have all the tools required to reclaim the title that was once hers. It will all come down to her next steps.